Our advice to anyone considering pipe-thawing methods is this: don’t do it. It doesn’t make sense to work at solving a problem when you can prevent it from ever occurring in the first place. So instead of attempting to thaw frozen pipes, keep your pipes from ever freezing in the first place. Powerblanket® knows how inconvenient, expensive, and unsafe frozen pipes can be. That’s why, along with our valve, manifold, and instrumentation heaters, we also provide a product for that important element in between. After all, it’s just as important to keep the pipes themselves from freezing, regardless of what type of fluid you may be pumping through them. With this in mind, we’d like to introduce you to the Powerblanket Pipe Heater, or Heated Pipe Wrap. The Powerblanket Heated Pipe Wrap harbors the same patented technology used in all Powerblanket heating products. This technology, along with its seamless implementation into an easy-to-use and durable blanket, saves labor costs and downtime through simple and fast installation, uninstallation, and reinstallation. Protecting fluids from freezing in harsh outdoor environments is what Powerblanket is all about, and Powerblanket pipe heaters make this a real possibility for your pipes or pipeline. See all the details of the Powerblanket pipe heater by downloading the free product spec sheet! How to Prevent Frozen Pumps and Piping? In the mining industry, it’s critical that slurry and other liquids are moved from point A in the pipeline to point B in the pipeline with no restrictions to flow. If freezing pipes or other restrictions happen, it is very costly and can shut the entire mining process down. Without proper preventative measures put in place, freezing pipes can and will happen. Powerblanket® pipe heaters and warmers solve the problem of freezing pipes and eliminate costly down time. The problem with ice building in the volute area of the pump is that it transfers to the piping. This restricts the flow and eventually shuts the line down. This results in dreaded down time, which is very expensive for mining companies. With Powerblanket custom applications the volute area can be heated to prevent freezing. This keeps the pump and pipeline free of ice and working properly. Powerblanket has effective heating solutions for most pump and pipe heating needs. Stay ahead of the cold weather and eliminate freezing pumps and pipes with an effective and energy efficient heating source. Cold weather’s impact on industrial and construction projects has never been more evident as it’s been on oilfield applications. The economic relevance of sustainable production makes benefits such as freeze protection and frac tank heating, the tip of the oilfield iceberg. The harshest climates and environmental conditions are not acceptable excuses or reasons for shut downs or work stoppages. There are many responsibilities and services these companies provide. Such services include rig transport and set-up, water transfer, and providing fluid and chemical treatment for flow enhancement. Each and every facet of the servicing process serves to benefit the production capabilities of the producing companies. Energy production in the U.S. is at an all-time high. In fact, the U.S. is quickly catching up to foreign production levels. From the oil sands of Alberta, Bakken, Marcellus, Anadarko, Eagle Ford and Permian;shale oil production is quickly increasing. The use of effective heating solutions can be an important part of the cold-climate production and business strategy. Companies tasked with the production and servicing within these plays know and understand the critical nature of maintaining production regardless of the environmental conditions. As efficient as some of these heating methods are, there is always the need for custom solutions. In fact, some of the heating solutions themselves are in need of heat protecting their on-board systems. The bottom line is there’s an essential need for heating solutions to protect everything from fluids to equipment and instrumentation. These solutions are not an expense; they’re an investment in sustainable production. How to Prevent Valves from Freezing? The best way to avoid valves from freezing is to apply a direct source of consistent heat. When pipes and valves freeze up, it can cause some down time along with additional costs for damaged valves. Regardless of what is flowing through the pipelines, avoiding damage means to avoid freezes, especially during the times that the pipelines are not flowing. To prevent valves from freezing I recommend heating them. A safe electrical heating source is the best way to go. You need to be able to control the temperature safely and evenly to avoid damaging the pipes or the contents inside. Finding a solution with an even distribution of heat is also important to avoid hot and cold spots. It is also easier to find a method of freeze protection vs. finding a solution to thaw a valve that is already frozen. It takes a lot more energy to thaw a solid, than it does to warm it enough to avoid freezing. So I also recommend finding a solution and getting it installed before the cold season begins. So when searching for a solution, look for a cost effective solution that can be easily maintained and installed without the costs of additional labor. How Can I Prevent Pipes from Breaking Between Crude Oil Pumps? Applying heat to your pipes will prevent your pipes from breaking when pumping crude oil. When you complete a pump and can’t clean your pipes, I recommend keeping the pipes warm to avoid build up. As you being a new pump, if there is an oil build up in the pipe, the pressure from the new pump can cause your pipes to explode. There are four key things to remember when working with crude oil, be sure to know what oil you are working with. Crude oil can begin to solidify at ambient temperature. Some crudes can become rock hard at 60°F, while others do not. Crude oil is considered a hazardous chemical and should be handled with care. Heat is required to maintain the flow ability of the oil. Because crude oil is considered a hazardous material and is combustible at temperatures between 230°F and 330°F. I recommend finding a safe and reliable heat source to work with that is certified for Class 1 Division 2 hazardous locations, and cannot heat over 150°F. What Do I Do to Keep My Pipes from Freezing? Freezing pipes is not an issue faced every day, but for the people who are suffering from frozen or cracked pipes it becomes the only thing they are able to focus on. Though a couple of these substances are no longer used to manufacture pipes they can likely still be found in use around the globe and most are susceptible to old man winter and his cold, harsh temperatures. Extremely cold temperatures cause water in pipes to freeze. This causes pipes to expand and eventually burst. Regardless of the material, many pipes will become stressed in extreme conditions so it’s important to keep them protected in these conditions, especially if they are exposed. You should start to become concerned about your pipes freezing when temperatures drop below 20°F and the pipes are either outside and not insulated or if they are indoors and exposed to cold winds. It’s not just frozen water that can cause cold temperatures to inhibit the functionality of pipes. Air flow can become a problem if temperatures fall below a certain point preventing critical ventilation for some very important machines. A nuclear power plant in the Midwest was susceptible to such a fate last winter when the possibility of cold temperatures threatened to shut down operations for several days, potentially causing the facility a loss of millions. Fortunately there are some solutions available that can help prevent broken pipes, protect your investments, and provide peace of mind. Several types of insulating sleeves are available and covering pipes with insulation is always a good idea. There are also some products on the market that offer heated pipe warmers as solutions as well. Keeping your investments protected is crucial. Knowing the environmental conditions and how to combat them are key to keeping your pipes safe and providing a restful nights sleep. Cold bites. And, nothing bites worse than frozen pipes. So, if you’re sick of trying to torch your pipes to get them flowing, I’ve got some ideas for you. The first time frozen pipes hit me was when I was young and dumb. Don’t get me wrong, I wasn’t trying to be dumb, but sometimes stupid happens. My wife and I were in our first home in the Salt Lake area and we left during the Christmas break to visit her family in the Midwest. We were gone for a little over a week. As luck would have it, Salt Lake hit a cold snap while we were gone, and as dumb would have it, I wasn’t prepared. When we got home, I found the sure sign of disaster…peeling paint and water stained sheetrock. In other words – a burst pipe. After a few choice words about my own mental incapacity, I plowed right in to fixing it. I hated every minute of it. Running water has a harder time freezing than stationary water. (I know, that’s a real shocker, huh?) However, flowing water can still freeze if the temperature drops too low—just like with a flowing river. Regular use will also tell you when an ice block is forming, because water flow will be restricted or cut off. If you’re vacationing and are smarter than I am, you should be concerned about pipes at home freezing. You can simply leave one or two faucets on to a slow drip. You’ll pay more for your water bill, but unlike me, you’ll save a lot more on the repair bill. Pipes freeze because the pressure between the freezing water and the faucet grows too great. A slow drip solves the problem by relieving the pressure. Thus, even if a pipe freezes, the ice will have room to expand and won’t break the pipe. Most homes in the colder regions are designed so that water pipes are kept inside the insulation of the home to keep them from freezing. But, if your home has poor insulation like mine, you may add a layer of insulation just for the pipe. Local hardware stores carry this kind of insulation and they are easy to install. These strips typically come in long sections that can be cut to fit the pipes. Older homes that already have insulated pipes can be updated with newer, more effective insulation. Pipe warmers wrap around a pipe and use electricity.. so the water is never cold enough to freeze. Pipe warmers are excellent for keeping exposed pipes from freezing in areas that are very cold for long periods of time. In extreme cold temperatures where other preventative measures fail, a pipe warmer will ensure the water never freezes. Pipe warmers are also ideal for industrial situations where large volumes of mission-critical liquid are at risk of freezing. The initial investment of purchasing a pipe warmer is minuscule compared to the savings and efficiency that comes from keeping an operation running in all weather conditions. Question: How do you keep your pipes from freezing? You can leave a comment by clicking here. Over half the U.S. population deals with the threat of frozen water pipes each winter season. The costs associated with frozen and broken water lines is enormous, not to the mention the nightmare caused by water damage. While an ounce of prevention might be worth a pound of cure, methods for preventing frozen pipes previously have been costly and ineffective at best. Until recently, best methods to thaw pipes included heat trace, insulation, or expensive high wattage heaters which simply aren’t practical. A new product has been developed that makes good on the “ounce of prevention” mentality that is both cost effective and highly efficient. Freeze prevention & pipe thawing can now be achieved with the “all-in-one” pipe wrap heating solution from the creators of the Powerblanket® heated pipe wraps. 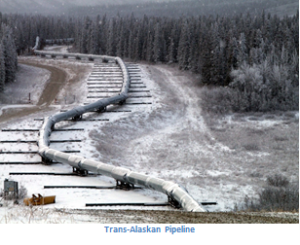 Powerblanket pipe wraps provide maximum freeze protection for a wide variety of applications. Heating, insulating, and protecting fluids from harsh outdoor environments is their specialty. Available in multiple lengths and diameters to fit any size section. The Powerblanket pipe wrap’s innovative “all-in-one” product design substantially reduces installation time, eliminates the need for multiple product procurement, and significantly reduces labor costs. The end result is an efficient, cost-effective heating solution with unlimited possibilities. Installing pipe wraps on long sections of pipe will maintain flowability and maximize production even in harsh winter conditions.